A Lakefront Cottage on Pequawket Lake, Brownfield, Maine. Above: Front of the house facing Pequawket Lake. 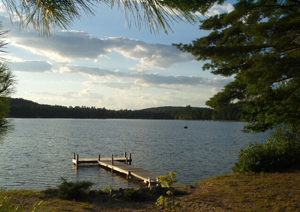 Above: A view from the back yard across the lake. Charming 3br lakefront house, sleeps 6. Available year-round. 15 minutes to Fryeburg, Maine. Amenities: 100' sandy, private beach on a spring fed lake. Dock, rowboat, paddle boat, 3 fireplaces (1 outdoor), deck,TV, VCR, DVD, modern k&b. Great for families with kids. Near White Mountain/North Conway recreational areas. A beautiful and relaxing lakefront retreat with great views of the White Mountains. Fall Amenities: Close to Saco River Canoeing and White Mountains for viewing Fall Foliage, hiking, and fishing. Winter Amenities: Close to Bridgton and Mt. Cranmore. Ideal for cross-country and snowmobile enthusiasts. A cozy winter getaway with fireplaces in Living room and Master Bedroom. Our guests return year after year and truly love it! Winter $1300 Per month, plus utilities. 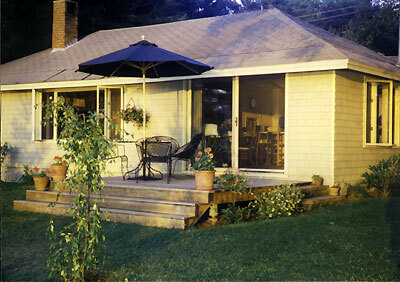 A week at our Maine Lakefront Cottage for a week at your Manhattan Residence, June or July.